I was invited to join an outfit challenge "a mom's outfit from day to night". I was hesitant to do a post like this because of honestly speaking, I am not a stylish one. I do not own fashionable clothes. I can't post my own OOTD (outfit of the day) as what they call it. 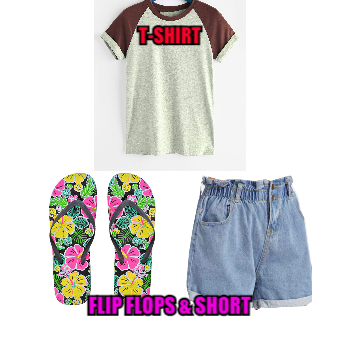 I thought of bringing my chosen clothes together to come up with an idea outfit that I as a mom prefers to wear during the day and when I'm about to go somewhere during the night with my family or friends. Moms like me are conservative since we already have insecurities due to pregnancy thingy. Can't help but accept the fact that moms are conscious about their figure. As long as my husband love me, I don't care about my imperfections, what matters is that be happy, be contented and be comfortable. Whether you wear the cheapest clothes in the market or old-fashioned dress, just be yourself. T-shirts as the most simple yet essential and basic piece of clothing in fashion history provide physical ease and relaxation in me. Paired with denim or cotton shorts, I'm able to do whatever I want to do. My rubber flip flops or we usually call it slippers at home, I can roam around without worries due to their convenience and comfort. I have these favorite style to wear if ever I was asked to go out with them or attending an occasion and it depends on the events as my outfit of the night. This is the style I love. No doubt, I am really comfortable with blouse, pants and not too high heel, the wedges. Clean lines and sharp edges give way to the Pyramid Earring. Plated in 14k Gold, this simple yet bold piece is what AUrate brand is all about. The blouse featuring front beauty print. Boat neckline. Drop sleeves. Curved hemline. Loose-fitting. Looks so comfortable with higher style waist pants and can be a partner with stilettos, wedges, flat shoes, sandals or sneakers. I preferred a pair of wedges featuring an open toe, both side cutouts look, ankle strap with buckle, cutout back looks wedges heels measure about 3.5 inches. I don't like too high heels. I'm afraid to stumble and get sprained. That's all! I hope you enjoy my outfit challenge. That's the usual Filipina stay at home Mom look from day to night. If you like the look, you can buy it all online. Just click on the links above and you'll be directed to the site. I'm happy to share the true me. ;) thanks for dropping by..